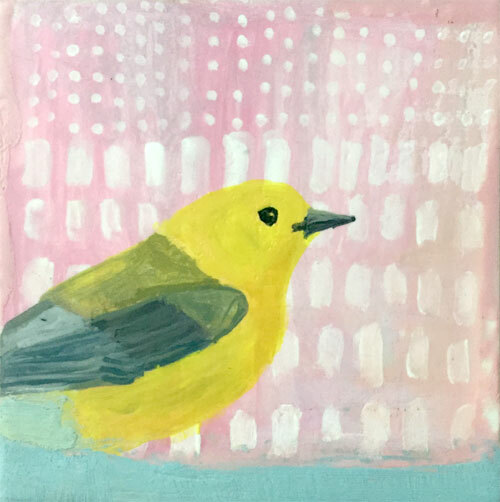 This sweet warbler is a Prothonotary Warbler specifically. I actually saw one recently I am pretty sure a few weeks ago. I heard it first and scanned the trees above me and saw the bright yellow. It could have been a different warbler as there are several and I did not have binoculars and I am definitely not an expert on birds. I only know the birds I painted last year! I suppose though that means I can identify 100 North American birds, at least! The bird I spied up in the branches reminded me of this bird that I painted in gouache last year. As well as being bright in color, it’s song was bright too. Spotting a Warbler can remind us that we have a voice that needs to be expressed. I read that Warblers were prized for their song and people would try to capture them and keep them in cages. But that they do not make good caged birds and prefer to sing when they are in the forest. I found that very interesting and beautiful in a way.